Report: Melky Cabrera signs with Jays — Who says cheaters never prosper? Question: What do you get when you cheat by taking performance enhancers, lie about taking performance enhancers, try to have someone convince folks you took performance enhancers by mistake by falsifying a website, get caught taking performance enhancers, then leave your team in the lurch in the middle of a pennant chase without so much as an “I’m sorry” or “goodbye”? That is the current state of Major League Baseball. Enrique Rojas of ESPNDeportes.com reported Friday that the Toronto Blue Jays signed outfielder Melky Cabrera to a two-year, $16 million. Given that the report came from ESPNDeportes, I first thought maybe something got lost in the translation. You sure it was 16 million DOLLARS and not $16 million PESOS? Cabrera earned $6 million last year with the Giants in his final year of arbitration. He put up MVP-like numbers, hitting .346 with 11 HR, 25 doubles, 84 runs, 60 RBI and 13 stolen bases in 113 games when he was suspended for 50 games on Aug. 15 for testing positive for testosterone. Then we didn’t hear a thing from Cabrera until late in the season when he withdrew himself from the NL batting title race, even though the rules would have allowed him to win the title despite missing the final 45 games of the regular season. Buster Posey ended up with the batting title. If not for the suspension, Cabrera was likely headed to a free-agent pay day in the neighborhood of five years, $75 million. By comparison, this is a deal for the Jays. But which Melky will the Jays be getting? Some believe that Cabrera’s positive drug test is reason to throw out his 2012 numbers, as well his a his 2011 numbers with the Royals (.305, 201 hits, 18 HR, 87 RBI). The REAL Melky, they say, is the one who hit 4 HR, 42 RBi and .255 with the Braves in 2010. I don’t quite buy that. And because of that, I was open to bringing Melky back on a cheap — almost conciliatory — one-year deal for, say, $3 million. Yeah, I know, that was naive … wishful thinking. Regardless of who he signed with, I thought for sure that Melky would seek a one-year deal, so he could prove to everyone that he could perform without the enhancers. Then cash in on the big contract he would have received without the suspension. It’s also hard to take his 2012 stats on face value given the performance enhancers. If the drugs didn’t enhance his numbers, why did he take them? But what kind of numbers can a PED-less Melky produce? Who knows. Not sure why the Blue Jays are so confident Melky can produce again at the level of 2011 and 2012. Maybe they read it on the internet. Or they can pull a Melky and not even bother saying anything at all. Or they can just wait to say it in person. The Blue Jays will be a AT&T Park on June 4-5. Pitching wins championships. It’s an overused cliche. But when it comes to the Giants, it’s true. Pitching drove them to the 2010 World Series title. It kept the team’s head above water when it lost Buster Posey in 2011. And it can keep the Giants driving toward the postseason in 2012. As of Aug. 16, the Giants’ team ERA of 3.66 ranks fifth in the National League. But it does not compare to the 3.20 ERA of 2011 or the 3.36 of 2010. However, if you remove Tim Lincecum’s numbers from the team ERA, it sits at a more comparable 3.38. 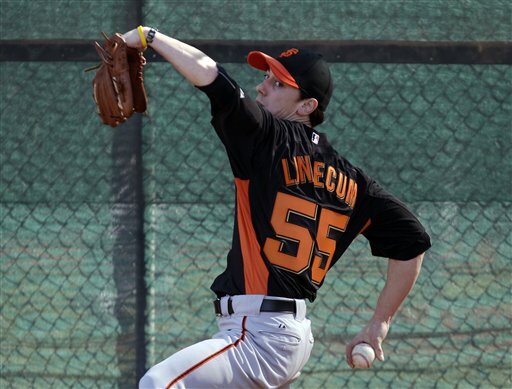 Now, we don’t suggest the Giants remove Lincecum from the rotation. We just use that stat to point out that the team’s ERA has been inflated by Lincecum’s dreary first half of the season. Since the All-Star break, Lincecum has a 3.33 ERA, right in line with what the rest of the staff has produced for the season. So if Lincecum can continue to pitch like he has since the All-Star break — and the Giants’ weaker schedule should help him do that — the Giants should have the pitching to keep them in the race. The loss of Melky Cabrera was truly devasting. But it’s nothing new to the Giants. It can’t compare to when the Giants lost Buster Posey for the season in 2011. 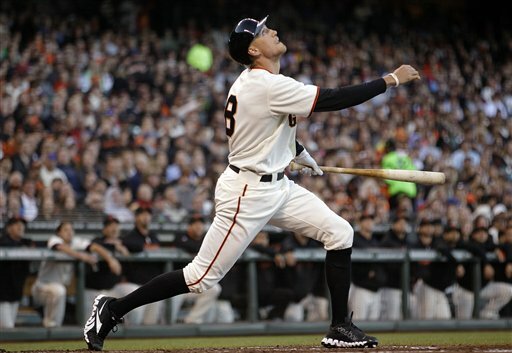 Many pundits like to say the Giants’ 2011 season effectively ended with Posey’s season ended with his ankle injury. Giants fans know better. When Posey’s season ended last year, the Giants were left with a lineup consisting of ailing Pat Burrell and Cody Ross and inept players like Aubrey Huff, Miguel Tejada, Andres Torres and Aaron Rowand. Freddy Sanchez’s season would end a couple weeks later. Put it all together and the Giants had the most anemic offense in many years. The Giants tried to replace Posey, who was playing a more vital position than Cabrera’s left field, with two players who struggled to hit .200 — Eli Whiteside and Chris Stewart. And the loss of Posey didn’t last six-plus weeks. It was four-plus months. Still, the Giants managed to remain competitve and stayed in first place into August. Their playoff push was eventually derailed by injuries to Brian Wilson, Sergio Romo and Jeremy Affeldt, not to mention a DL stint by Carlos Beltran. Even with all that, the Giants made a late push in September that almost got them back into the wild-card race. If the Giants could do that in 2011 without Posey, the 2012 Giants certainly could manage with Cabrera. In need of a prayer, the San Francisco Giants added a Christian. As expected, the Giants recalled Justin Christian from Triple-A Fresno to fill the roster spot created by outfielder Melky Cabrera was suspended for the rest of the regular season. So it looks like Gregor Blanco will be the Giants’ starting left fielder for the immediate future, with Christian providing an option against left-handed pitchers. Christian has hit .348 at Triple-A Fresno this season. But in his brief stint with the Giants, he’s produced a batting average that would only be impressive to Aubrey Huff. He hit .158 in 41 plate appearances before being sent down on Aug. 1. When Dan Otero was also headed to Fresno, MoreSplashHits thought that perhaps the Giants would have enough good sense to call up another position player, returning to the 13 player/12 pitcher roster. Instead, they called up Eric Hacker from Fresno to serve as the long man in the bullpen, until either Brad Penny comes off the DL or Guillermo Mota returns from his suspension. Manager Bruce Bochy went to a 13-pitcher roster a couple of weeks ago to lessen the strain on a bullpen that had begun to show signs of weakness, particularly in a 20-game-in-20-day stretch. But now with the day off Thursday and another on Aug. 27 before rosters expand on Sept. 1, that seems to be less of an issue. Also, with a lineup that included Cabrera, Angel Pagan, Buster Posey, Pablo Sandoval and Hunter Pence, Bochy said he wouldn’t be doing much pinch-hitting or double switches. Take Cabrera out of that mix and insert Blanco, and Bochy may want to have more flexibility in his lineup. One potential option the Giants should consider to fill the Cabrera void is a lineup in which Posey plays first base, Hector Sanchez catches and Brandon Belt plays left field. Posey played quite a few games at first this season as the Giants looked to keep his bat in the lineup and give him a bit of a break from catching. But with Belt swinging a hot bat of late, would it not make sense to keep both Posey’s and Belt’s bat in the lineup? Plus there would be less of a drop-off in offensive production from Cabrera’s .346 average with Sanchez’s .279 average than than Blanco’s .236. But that’s not the only advantage. It keeps Posey in the lineup more, and keeps him fresh as the season grinds into its dog days. While it’s true that Belt has not played a game in the outfield since spring training this season, he did play 31 games in left field last season and handled himself well enough. The Giants could make this work by sending Hacker back to Fresno and calling on Eli Whiteside to serve as the No. 3 catcher. San Francisco Giants lose Melky Cabrera to 50-game suspension … Now what? It’s been a great season to be blogging about the San Francisco Giants, as they have provided a wealth of material this season, both good and bad. Matt Cain’s new contract, Madison Bumgarner’s new contract, Buster Posey’s shingles, Brian Wilson’s elbow, Tim Lincecum’s struggles, All-Star voting, four All-Star starters, Melky Cabrera as All-Star MVP, trading for Hunter Pence. This list goes on and one. Then came news Wednesday that we didn’t want to blog about. The San Francisco Giants suffered a huge loss Wedneday, and they hadn’t even made a single pitch. Major League Baseball announced that outfielder Melky Cabrera will be serving a 50-game suspension for testosterone immediately, taking him out of the remaining 45 games of the 2012 season and the first five games of the postseason, if the Giants are so fortunate to get that far. And if you were hoping for a Ryan Braun-like appeal victory, forget about it. Truly disappointing news. But now the major question is: Now what? Tuesday’s game was the first time the Giants had a lineup that included Angel Pagan, Melky Cabrera, Buster Posey, Pablo Sandoval and Hunter Pence at the same time. It will be the last time we’ll see that lineup in the 2012 regular season. In the short term, Gregor Blanco will fill Cabrera’s spot in the lineup, only because the Giants have no other outfielder on the 25-man roster. That’s part of Giants’ decision to go with 13-pitcher roster. Blanco started off very well for the Giants, moving into the leadoff spot and dropping Pagan to the No. 5 spot. But Blanco has struggled in recent weeks. He was hitting .291 with a .387 OBP on June 9. Since then, he’s seen his average plummet to .232 with a .329 OBP. He’s been struggling so much, the Giants placed him seventh in the order, just ahead of Brandon Crawford in the Giants’ batting order Wednesday vs. the Nationals. And you would have to argue why Blanco isn’t hitting in the No. 8 spot, given how Crawford has been swinging the bat lately. TRIPLE-A: Outfielders in Fresno include Justin Christian, Todd Linden, Ryan Lollis, Xavier Nady and Francisco Peguero. Christian has hit .348 at Triple-A, but in 22 games with the Giants this season, he’s hitting a whopping .158. In fact, none of the players the Giants called up from Fresno this season have hit at the big-league level. Those kind of takes any luster off averages put up by Lollis (.319), Linden (.280) and Peguero (.274). Nady was signed late last month as roster depth at first base. But he has played the outfield. However, he’s hitting .138 in 29 at-bats in Fresno, with 2 HRs and 7 RBI. Peguero is one of the Giants’ better outfield prospects who got off to a slow start at Triple-A this season. But he has hit better in recent months. He’s hitting .409 in his past 10 games. Lollis, 25, was promoted from Class A San Jose recently. He has hit .327 in 30 games at Fresno. But again, Fresno averages have not converted well into big-league averages this season. AUBREY HUFF: Yeah, I know, that one excites you. There has been talk that Huff was about ready to give another shot at coming off the DL with his bad knee. He tried it once and didn’t last long. But this has been a lost season for Huff, who has hit .148 in 34 games. BRETT PILL: Pill has hit .222 in 99 ABs this season for the Giants. He performed OK in his most recent stint from July 31 to Aug. 11, when he was 5 for 20 (.250) with one home run in seven games. He started seven games in left field earlier this season. However, having just been sent down to Fresno, so he can’t be recalled for another week. GARY BROWN: The Giants’ top prospect is hitting .280 at Double-A Richmond. But he took so long to find his hitting stroke at Double-A, it’s doubtful the Giants will look to ask him to adjust to the big leagues in a pennant chase. WAIVER WIRE? By now, the options have to limited. Alfonso Soriano? Are the Giants ready to take on the remaining $40 million on his contract for the next two-plus years? Doubtful. Seattle’s Chone Figgins is due $8 million next year. But back-to-back years of hitting .188 is hardly attractive. Jason Bay is due $16 million next year. Juan Pierre is making $800,000 for the Phillies this season. What would it take for the Giants to deal for him? David DeJesus will make $4.25 million for the Cubs next season. Are the Cubs ready to go in another direction? Basically, if a player is good, he’s going to cost prospects. But then again, if he’s good, he wouldn’t have passed through waivers. If he’s cheap, there’s no reason for another team to trade him. So the Giants are going to need to take a chance on a reclaim project or someone with a hefty contract chained to them. Somebody call Aaron Rowand and see what he’s doing. When the Giants traded for Freddy Sanchez in 2009, MoreSplashHits was wary of trading away pitching prospect Tim Alderson. But that deal worked out for the Giants, as Sanchez was a key member of the 2010 World Series title team, and Alderson has not amounted to much. When the Giants traded for Carlos Beltran last year, MoreSplashHits was wary of trading away Zach Wheeler. That deal did not work out for the Giants, as Beltran struggled, then got hurt, then got hot, but a bit too late to help the Giants make the playoffs. Meanwhile, Wheeler was just promoted to Triple-A for the Mets last week. So when the Giants traded for Hunter Pence last week, MoreSplashHits was again wary. But it wasn’t because of the players the Giants gave up — OF Nate Schierholtz, C Tommy Joseph and P Seth Rosin. Schierholtz was basically on his way out of San Francisco, basically request a trade. Schierholtz had been given the chance to win the starting right field job each of the past three seasons, but was unable to do so. We still think Schierholtz will be a good big-league outfielder, in the right lineup and in the right ballpark. But in San Francisco, he was going to be little than a good reserve outfielder. Joseph was the center piece of the deal. He was the No. 4 prospect in the Giants system according to Baseball Prospectus. But with Joseph a catcher, it was an area of strength of the Giants. Their best player is a catcher in Buster Posey. They also have a young backup in Hector Sanchez. And Andrew Susac, the No. 6 Giants prospect, is playing well at Class A San Jose. Rosin, once on the Giants’ list of top-20 prospects, has faded in the past year or so to a marginal prospect. So the concern wasn’t as much on what the Giants gave up to get Pence, but what the acquisition of Pence would mean to the organization going forward. Pence is earning $10.4 million this season in his third year of arbitration. He will have one more year of arbitration, which will likely put his 2013 salary around $13-$14 million. With Melky Cabrera expected to require a multi-year deal at a similar per-season salary, it left us to wonder whether the Giants could afford an 2013 outfield that consists of both Pence and Cabrera. Giants GM Brian Sabean said there is room in the budget for both. Sabean also said he’d like to keep Pence beyond 2013. Well, that’s encouraging. It’s also encouraging that the Giants brass was willing to take on a salary like Pence’s ($10.4 million) in exchange for Schierholtz ($1.3 million). 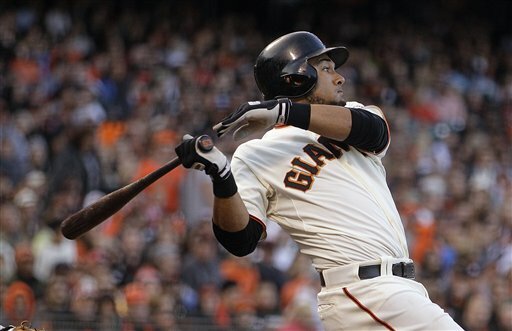 It may be a sign that the Giants are willing to enter 2013 with a payroll significantly above the current $130 million. By MoreSplashHits’ calculations, the Giants would have about $25 million in 2013 to re-sign Cabrera, add another outfielder and a starting second baseman. If they bring back Cabrera and Pence, that would cost in the neighborhood of $27 million for 2013. That would leave the Giants with a budget of $132 million for 2013 and still in need of a second baseman, as it does not appear there is one ready to make the jump to the majors from within the system. And they would need to find someone to play center field, as a payroll that includes Cabrera and Pence would almost certainly take Angel Pagan out of the mix. Pagan is set to make $7-$8 million a year in free agency last season. Plus, they wouldn’t want to block the path of top prospect Gary Brown, who after a slow start is playing well at Double-A Richmond. Brown is hitting .287 with a .349 OBP, seven HRs, 37 RBI and 64 runs. But unless Brown is promoted to Triple-A very soon, it doesn’t seem likely that he will be an option to start in center in 2013 for the Giants. And Gregor Blanco’s struggles doesn’t really make him a strong candidate either. So even if the Giants are able to bring Cabrera back, there are still questions lingering for 2013. C Tommy Joseph, 21, was drafted in the second round of the 2009 draft out of Horizon High School in Scottsdale, Arz. Joseph hit 16 HR, 68 RBI and .236 in 117 games in Class A Augusta in 2010. He hit 22 HR, 95 RBI and .270 in 127 games for Class A San Jose in 2011. This season for Double-A Richmond, he had 8 HR, 38 RBI and hit .260 in 80 games. P Seth Rosin is a 6-6, 23-year-old right-handed pitcher who was drafted in the fourth round of the 2010 draft by the Giants out of Minnesota. Rosin went 2-3 with a 3.34 ERA in 89 innings for Class-A August in 2011, making 10 starts in 39 games. He was 2-1 with a 4.31 ERA in 34 games (five starts) for Class A San Jose this season. He struck out 68 in 56.1 innings with 18 walks. 2B Charlie Culberson (traded to Colorado for Marco Scutaro), 23, was drafted in the first round in the 2007 (51st overall, sandwich pick) out of Calhoun (Ga.) HS. The Giants had high hopes for Culberson. But his minor-league career peaked in 2010 for Class A San Jose when he hit .290 with 16 HR and 71 RBI. After hitting .259 with 10 HR and 56 RBI for Double-A Richmond last season, he hit .236 with 10 HR an 53 RBI in 91 games for Class A Fresno this season. He had a brief spell with the Giants in May when Ryan Theriot went on the DL. But he was 3 for 22 (.136) with 7 Ks and one RBI in six games. During last weekend’s Fox telecast of the Giants-Phillies game, the announcers were discussing how Melky Cabrera has been the Giants’ team MVP in 2012. Consider through Monday, Cabrera had 45 multi-hit games this season. In those games, the Giants are 30-15. In 17 games this season, Cabrera has failed to get a hit. In those games, the Giants are 6-11. You could even make an argument for Cabrera for NL MVP. And that leads to a basic conclusion: The Giants MUST re-sign Melky Cabrera. During the All-Star break, Cabrera expressed his desire to remain in San Francisco next year and beyond, and he let his representatives know that. Earlier this year, Giants GM Brian Sabean said the “stars would have to align” for the Giants to re-sign Cabrera. So MoreSplashHits will help Sabean out with a little astronomy. The Giants have a $130 million payroll in 2012. In 2013, they are locked into almost $80 in guaranteed contracts ($22 million for Tim Linceum, $20m each for Matt Cain and Barry Zito, $5.7m to Pablo Sandoval, $5m to Ryan Vogelsong, $4.25m for Javier Lopez, $2m buyout for Aubrey Huff and $750K to Madison Bumgarner. They will have nine players who will be arbitration eligible. Three of those are prime candidates to be non-tendered: Brian Wilson, Eli Whiteside and Emmanuel Burriss. That leaves six others: Buster Posey, Santiago Casilla, Sergio Romo, Clay Hensley, Nate Schierholtz and Joaquin Arias. It is reasonable to think the Giants can sign all of those players for a combined $18 million. That puts the payroll at $98 million for 13 players. There are four pre-arbitration players who almost certainly will be back: Brandon Belt, Brandon Crawford, Hector Sanchez and Gregor Blanco. That puts us at about $103 million for 17 players. Eight more players left to fill out the roster and $27 million left to make that happen … if they hold the line on payroll. More if they decide to go a little higher. And what type of players would these eight players need to be? If they filled five of those spots with players within the organization or non-tender free agents on the cheap, they could probably do so for another $4 million. Now, we are at $107 million. Still another $23 million to work with. Now how much will Cabrera cost to bring back? There are the high water marks for outfielders, like the $16.5 million average for the deal the Dodgers gave Andre Ethier for five years. Or the $13 million average the Orioles gave Adam Jones. I’ve seen a couple of bloggers who put Cabrera’s worth at around $12 million a season. If the Giants could sign Cabrera for five years, $60 million, they should do so in a heartbeat. However, we believe Cabrera will go a bit higher. So even if we look on the high end and put Melky’s deal at $15 million, it would still leave $8 million to add another outfielder and starting second baseman. A little tight, especially if the Giants have any hopes of bringing Angel Pagan back as well. With a little creativity, the Giants front office could find a few extra bucks in the budget. And, as we mentioned, this budget is based on the high end of potential deals. Also, there are two seasons of sellouts bringing in a bucket full of cash. So the front office could afford to spend a few extra bucks on players. Because we know the Dodgers will.